Prepare your mind to worship God. J.P. Moreland and Mark Matlock sound a wake-up call to young believers to sharpen their intellect and understand the reasons behind their faith in Christ. - Publisher Prepare your mind. 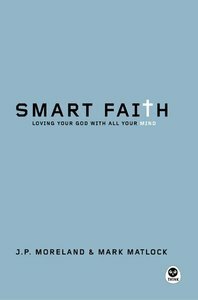 Smart Faith challenges you to gain a deeper understanding of what it means to "love God with all your mind." Full of relevant examples and analogies, Dr. J. P. Moreland and Mark Matlock enable you to grasp the theological and philosophical foundations of faith. Learn to: Identify fallacies of logic-your own and others' Embrace the mind's role in spiritual formation Acquire new spiritual disciplines Become a more well-rounded, intellectual disciple-someone who can clearly elucidate the finer points of the Christian faith. Take back your mind and be smart about your faith. Become a more well-rounded, intellectual disciple--someone who can clearly elucidate the finer points of the Christian faith. Learn to embrace the mind's role in spiritual formation and acquire new spiritual disciplines. Prepare your mind. Smart Faith challenges you to gain a deeper understanding of what it means to "love God with all your mind." Full of relevant examples and analogies, Dr. J. P. Moreland and Mark Matlock enable you to grasp the theological and philosophical foundations of faith. Learn to: Identify fallacies of logic-your own and others' Embrace the mind's role in spiritual formation Acquire new spiritual disciplines Become a more well-rounded, intellectual disciple-someone who can clearly elucidate the finer points of the Christian faith. Take back your mind and be smart about your faith. J. P. Moreland, Ph.D., (University of Southern California) is Distinguished Professor of Philosophy at Talbot School of Theology, Biola University, in La Mirada, California. He also serves as director of Eidos Christian Center. He has written, edited or contributed to twenty books with publishers ranging from Oxford University Press, Routledge, Wadsworth and Prometheus Books to Zondervan and InterVarsity Press. Among his books are Christianity and the Nature of Science, Does God Exist? (with Kai Nielsen) and Philosophical Naturalism: A Critical Analysis. He has also written helpful apologetic books for thinking people which include Body and Soul, Philosophical Foundations of a Christian Worldview, The Creation Hypothesis, Philosophy Made Slightly Less Difficult, The God Conversation and To Everyone an Answer. Most recently he has authored The Lost Virtue of Happiness and In Search of a Confident Faith with Klaus Issler.